Holy Trinity Church was built in 1842, of dark grey stone in Early English style. 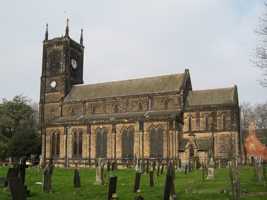 It comprises a chancel, clerestoried nave with 4-bay arcades, aisles, north porch, vestry and a large west tower with pinnacles, containing a clock. The architect was H I Stevens. At first there was one bell, then five more were added in 1856 and finally another two were donated by Albert and Frederick Ball in 1902. The bells were re-tuned in 1999, two replaced and a new steel bell frame installed. The choir and organ, formerly in the gallery, were moved to the north side of the chancel in 1870. A new west balcony was added and the chancel was reordered in 1892. There is a reredos with tiled dado and inscription by Powell & Sons (1911) with Fdk. Ball. The chancel screen is by J Rigby Poyser (1931) and the altar is of Japanese oak (1972). The interior has tall quatrefoil piers and all with lancet windows. In the east window is unusual and attractive floral glass in memory of the church’s founder Francis Wright, who imported rare trees for the churchyard. There are several other stained glass windows including a Boer War Memorial by Heaton, Butler and Bayne. Above all visitors go to see the richly carved mid-12th century font from the old Lenton Priory. It is one of the most interesting in the country, one of only five rectangular narrative fonts. It is almost square, of stone, measuring 34 ins. x 28 ins. x 30 ins. high, and the bowl intended for complete immersion. The sides are carved with scenes of Jesus’ Baptism, Crucifixion (with the soul of the penitent thief emerging from his mouth and soaring upwards, that of the impenitent thief being consumed by a dragon) and Resurrection, with the three Marys at the Sepulchre. Also depicted is the Dome of St Sophia in Istanbul. The style has no parallel in England.